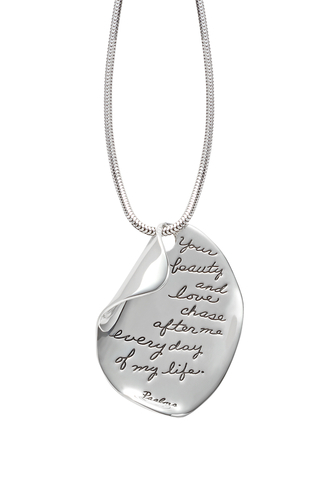 A sterling silver medallion features a delicate turning page corner. Wear this to remind yourself that as the pages of your life turn, God is with you. His beauty and love surround you. The quote comes from Psalms 23:6 (MSG), one of the most popular chapters in the Bible. It brims with hope, love, and optimism.